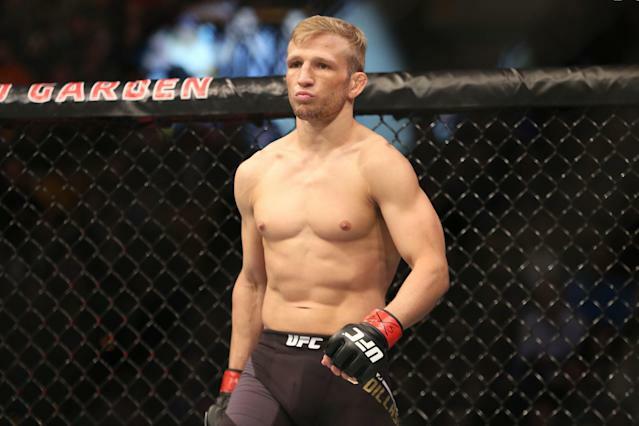 On Tuesday, the U.S. Anti-Doping Agency announced that former UFC bantamweight champion T.J. Dillashaw will receive a two-year ban for testing positive for EPO. On Friday, Dillashaw addressed the suspension, appearing contrite in an Instagram video where he apologized to fans and the people around him. “I messed up,” Dillashaw said wearing a sling on his right arm. “I’ve been having a hard time trying to forgive myself for this. Which I should have a hard time. ... I understand the criticism that’s gonna be coming my way. Dillashaw said he was in the sling for shoulder surgery he had on Thursday. He plans to have another procedure on his left shoulder to address rotator cuff and labrum tears. Dillashaw, 33, said he did not fight the penalties and made no attempt to explain or justify his use of a banned substance. He also vowed to come back. “I’ve got to man up to what I did,” Dillashaw said. “I accepted all penalties. I didn’t try to fight this thing. I’m gonna sit the next two years. EPO is a drug that increases red blood cell production and improves endurance though an increased capacity to carry oxygen in the blood stream. Disgraced former cycling champion Lance Armstrong admitted to using the same drug. It is the most well-known source of doping in sports according to the USADA. Dillashaw has a 17-4 record in the UFC with 8 knockouts. He has twice held the bantamweight championship belt, which he relinquished upon his suspension.